The church's Crazy Uncle role in society is great fun for secularists. However, Church doctrine is taken quite seriously by the devout, fervent majority of Catholics. The latest manifestation of the Catholic Church's Crazy Uncle tradition is an offer of time off after-life tortures. This is a reference to painful horrors that believers are conditioned to expect awaits them after death in a hell-hole called Purgatory. However, some time off from the frightful things that a loving god does to Catholics in Purgatory can be obtained through indulgences. The latest indulgence on offer is available simply for following the Pope on Twitter. While this sounds like a send-up from the comics at The Onion, the source of the story is actually serious exemplar of the journalism trade. (See Tom Kington, "Vatican offers 'time off purgatory' to followers of Pope Francis tweets," The Guardian, July 16, 2013.) The story is for real. As in the Middle Ages, indulgences entail the promise of some vague level of less torture after you die, unless of course you find yourself sentenced to hell. Then you are doomed to unspeakable, eternal miseries beyond imagining. Indulgences do no good for the souls cast into the ghastly holocaust of holocausts. While details are not available as to how much less burning in Purgatorial flames is associated with most indulgences now on offer, any time off Purgatory for good behaviors seems desirable. I think all will agree that following the tweets of Pope Francis is a good way to catch a break from the hellish agonies of third degree burns which await those sinners that the Catholic God determines need a good going over by his devoted enforcers. "requisite devotion." I’m not sure but there might be an expectation of love offerings involved in this, as well. IThe Sacred Steps in Rome. If you do that, the agents of a loving God will subject you to seven entire years less torture. Wow. 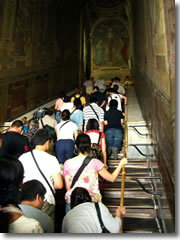 If I were a true-believing Catholic, I’d be up and down those steps all day, day after day, until dead from exhaustion. But, let’s say you’re not into exercise, even for such a good cause (i.e., less torture). You can reduce the time given over to the agonies of Purgatory and speed your way into the ecstasies of heaven if you attend Catholic World Youth Day in Rio de Janeiro, Brazil. Sacred Apostolic Penitentiary” (SAP), exists solely to promote the forgiveness of sins. The good SAP Court offers torture indulgences for those who simply follow the "rites and pious exercises" of Catholic World Youth Day on television, radio or through social media. It seems to me the Catholic Church is really going out of its way to cut back on the tortures of Purgatory. However, I would caution stay-at-home World Youth Day viewers not to overindulge in drinking beer and eating chips or dozing off or otherwise observing the proceedings in a less than reverent and pious manner. I love it when the Church acts like somebody's crazy uncle. When it’s issuing indulgences, making saints, confirming miracles and acting crazy, it’s not working through it’s cardinals and bishops and priests and Catholic zealot organizations to lower the wall separating religion from government, and thus seeking to separate the American people from their liberties. employees to access the birth control provisions in the Affordable Health Care Act and to subject us all to funding parochial schools and rebuilding their churches damaged by “acts of their own God,” religious symbols on public property, “under god” babble in the pledge of allegiance, “in God we trust” on our national currency, commandments on public property and prayers at civic functions. And that's just a sampling of what the Church does to advance its agenda of a more theocratic America. Sometimes, it’s hard not to appreciate a crazy uncle.